Every marketer has a set of strategies, tools, and tricks to build a successful lead generation campaign. And since leads are the lifeblood of a sales organization, healthy B2B lead generation is crucial for business growth. If lead generation is a current issue for your business, you’re most likely seeking ways to increase it. Make that CTA easy to click via multiple locations on page, inline links, etc. 2. DON’T FOLLOW THE CROWD If you continue to innovate, rather than emulate, you will build a more stable, loyal customer base. Instead of following what everyone else is doing, take a deep assessment of what your business and its customers specifically need. Then create b2b marketing lead generation campaigns that speak directly to your findings. Want to have a chat with the b2b lead generation and marketing services experts at ResponsePoint? Set up a free, no-obligation phone call. In one 15-minute conversation, you may discover a better way to get more leads. 3. USE TOOLS WISELY There is a marketing tool that serves almost any scenario. In that sea of choices, which tool is right for your business? Which will benefit your particular strategy and long-term lead generation needs…and how do you even determine that? In most cases, the right marketing tool is only as good as its backup. The spectrum of lead generation services that must align with any tool needs to be considered before choosing. Once the tool is implemented, who is keeping it going? Is the tool really making thing easier for the teams? If you are considering adding a more one-on-one customer experience, for instance, you’ll want to collaborate with a lead generation services provider that is experienced with customer service and the power of authentic connections. A tool is only effective when used, and when used by the appropriate operator. 4. DON’T GO LOOKING FOR A WHOLE NEW WHEEL The most successful B2B lead generation efforts are a balance of traditional marketing techniques and current trends. The more tried and true approaches should not be dismissed, as they offer important support to any b2b marketing lead generation campaign. Telemarketing: If no one is connecting directly with your prospect, you might lose the lead. Over-reliance on email, especially automated campaigns, can numb prospects to your messaging. Telemarketing paired with other techniques can dramatically improve your lead quality and accelerate the generation process. Content Marketing: Content is everything, and it can change everything for a business. Here’s where quality is key: your content needs to be targeted, authentic, well-written, strategic, and persuasive. It needs to resonate, compel and convert. Event Marketing: For some big companies and verticals, webinars for example can be vital to increase the ongoing market knowledge. For others, it may be only tradeshows or self-hosted executive in-person events. Email Marketing: Besides nurture and retainer campaigns, email marketing allows for expanding upon and optimizing content, customer demographics, and more. Make sure you don’t fall into the mode of set it and forget it. Direct Mail: This old school marketing approach may not be the most alluring route, but it’s a true ally in a well-integrated campaign. Direct Mail is perfect in Account Based Marketing (ABM), for verified target prospects, follow-up to events, visual campaigns, etc. 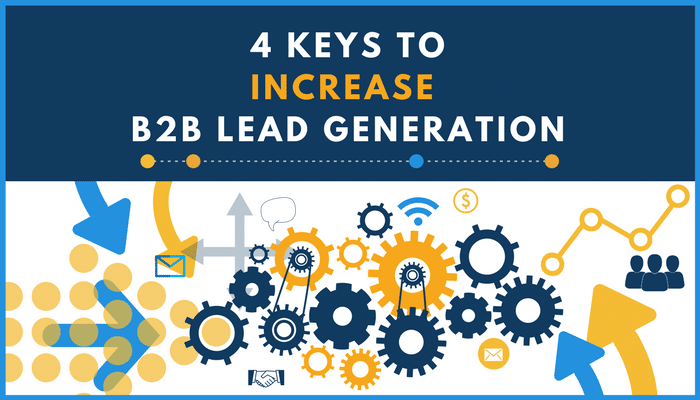 Fostering a healthy B2B lead generation effort is essential for your business. Collaborating with the right lead generation experts is the key to creating a seamless process that can grow with your success.